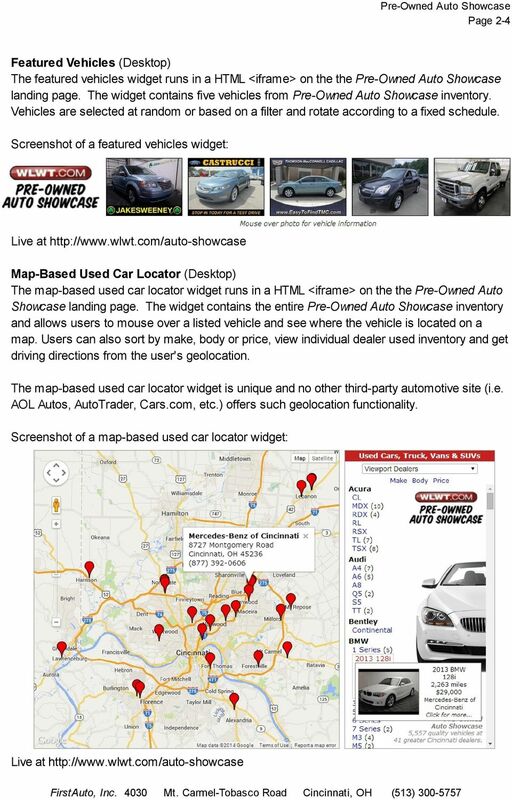 4 Page 3-4 Mobile (Smart Phones & Tablets) The mobile version of Pre-Owned Auto Showcase is an HTML 5 application optimized to run in a web browser app on a mobile device. The mobile application gives users the same 'look and feel' of the 300x600 inventory adbanner on their smart phone or tablet. 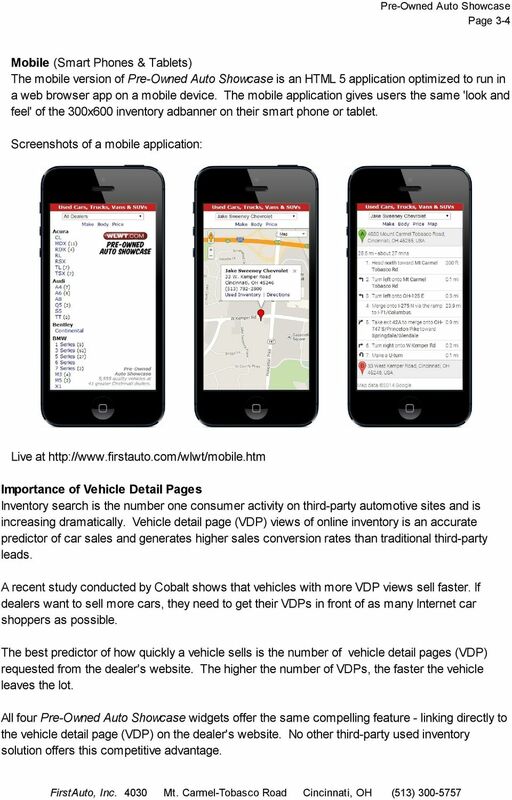 Screenshots of a mobile application: Live at Importance of Vehicle Detail Pages Inventory search is the number one consumer activity on third-party automotive sites and is increasing dramatically. Vehicle detail page (VDP) views of online inventory is an accurate predictor of car sales and generates higher sales conversion rates than traditional third-party leads. A recent study conducted by Cobalt shows that vehicles with more VDP views sell faster. If dealers want to sell more cars, they need to get their VDPs in front of as many Internet car shoppers as possible. The best predictor of how quickly a vehicle sells is the number of vehicle detail pages (VDP) requested from the dealer's website. The higher the number of VDPs, the faster the vehicle leaves the lot. All four Pre-Owned Auto Showcase widgets offer the same compelling feature - linking directly to the vehicle detail page (VDP) on the dealer's website. No other third-party used inventory solution offers this competitive advantage. 5 Page 4-4 Dealers continue to make significant investments in their websites and are including more information and functionality on their vehicle detail pages. 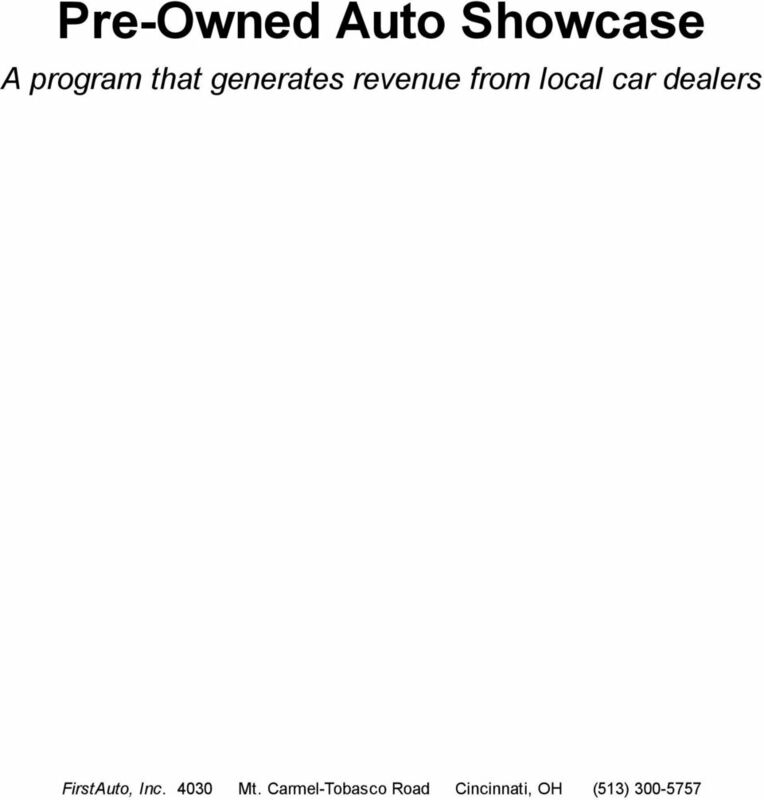 The Pre-Owned Auto Showcase program leverages that investment by linking directly to the most important page on the dealer's website - the vehicle detail page. 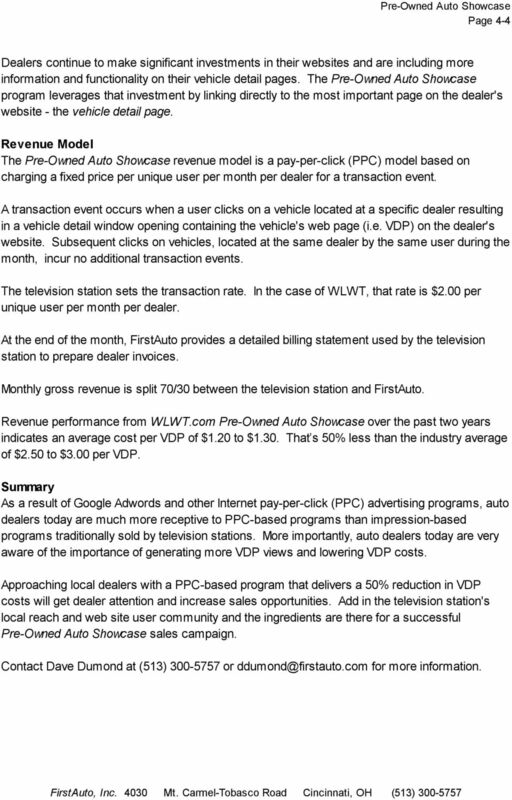 Revenue Model The Pre-Owned Auto Showcase revenue model is a pay-per-click (PPC) model based on charging a fixed price per unique user per month per dealer for a transaction event. A transaction event occurs when a user clicks on a vehicle located at a specific dealer resulting in a vehicle detail window opening containing the vehicle's web page (i.e. VDP) on the dealer's website. Subsequent clicks on vehicles, located at the same dealer by the same user during the month, incur no additional transaction events. The television station sets the transaction rate. In the case of WLWT, that rate is $2.00 per unique user per month per dealer. At the end of the month, FirstAuto provides a detailed billing statement used by the television station to prepare dealer invoices. Monthly gross revenue is split 70/30 between the television station and FirstAuto. 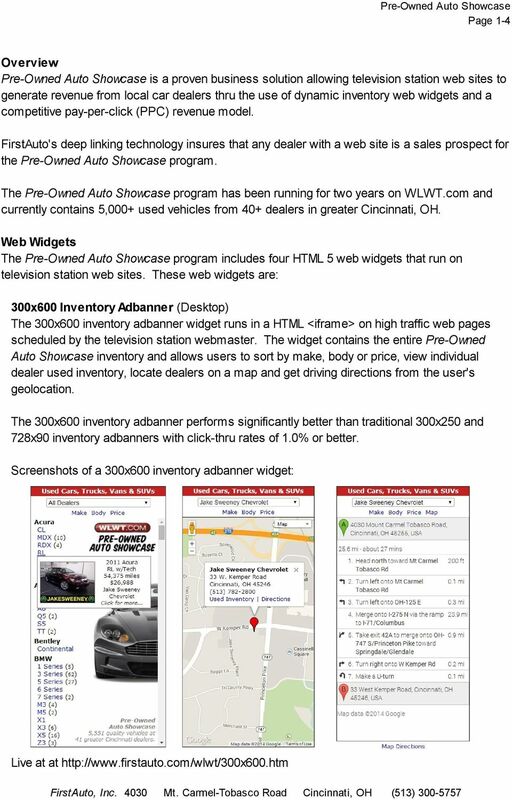 Revenue performance from WLWT.com Pre-Owned Auto Showcase over the past two years indicates an average cost per VDP of $1.20 to $1.30. That s 50% less than the industry average of $2.50 to $3.00 per VDP. Summary As a result of Google Adwords and other Internet pay-per-click (PPC) advertising programs, auto dealers today are much more receptive to PPC-based programs than impression-based programs traditionally sold by television stations. More importantly, auto dealers today are very aware of the importance of generating more VDP views and lowering VDP costs. 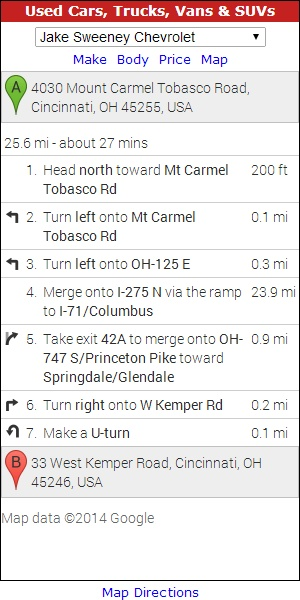 Approaching local dealers with a PPC-based program that delivers a 50% reduction in VDP costs will get dealer attention and increase sales opportunities. Add in the television station's local reach and web site user community and the ingredients are there for a successful Pre-Owned Auto Showcase sales campaign. Contact Dave Dumond at (513) or for more information. Jeremy Levy. EDUCATION Concordia University 2000 Marketing Communications. EXPERIENCE Digital Sales Consultant e - Dealer. 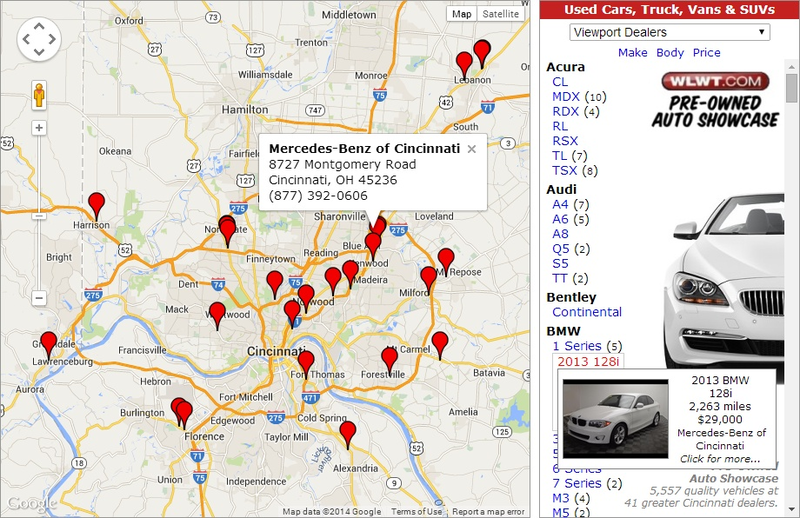 Use the Power of Your Data Inside Your Current Tools to Sell More Cars! & Second Part is What is Your Website Hiding? Dealer.com SEO. Proven performance, through professional partnership. 39% More Sales. 100% Digital. Progressive strategy, partnership, and results at Terry Henricks Chrysler Dodge Jeep Ram. MHABC AGM Presentation FINAL BRAND EXAMPLE MEMBER DECAL WEBSITE MOCK UP WHAT IS PAID SEARCH ADVERTISING Paid search Advertising Is the process of gaining traffic by purchasing ads on search engines (Google).